An Israeli police raid on a medical marijuana dispensary has sparked protests in Tel Aviv. An Israeli police raid Wednesday on the Rehov Ibn Gvirol medical marijuana dispensary Tel Aviv sparked protests Sunday by aggrieved patients, the Jerusalem Post  reported. The dispensary, which is operated by Tikkun Olam , the country's largest medical marijuana supplier, remained closed after the raid. Dozens of disabled and terminally ill patients protested outside the clinic, waving ID cards and clamoring to receive their monthly medicine. Tikkun Olam set up a makeshift sales counter in the courtyard of the building, where dozens more medicated on the spot. Police said they suspected significant amounts of marijuana had been given to criminal organizations that used fake prescriptions. Police detained two managers at the storefront and questioned them for hours about illegal drug trafficking. Police also claimed they had received complaints the group was handing out marijuana in amounts greater than the 30 grams a month allowed under Israeli regulations. 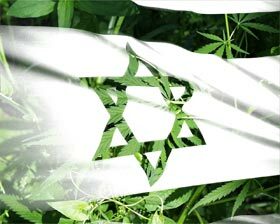 Israel has suffered from a hashish shortage for the past year, and police believe criminal elements are diverting medical marijuana to the black market. But Tikkun Olam spokesman Shai Meir told reporters that the raids served only to harm legitimate medical marijuana patients. "The bottom line is that the only ones who have suffered as a result of these police actions are the patients. Every arrest, every detention of a patient disrupts their treatment, treatment that demands routine. This causes serious harm to the patients," Meir said. One patient who took part in the protest, Yedidya Kanuf, said medical marijuana was a lifesaver for him. As he spoke, he sat inside the apartment in a wheelchair hooked up to a portable oxygen system. Kanuf has been paralyzed since a car accident a decade ago. "Before I was on medical marijuana, I was being treated for pain with all types of very strong drugs. I never got out of bed, never saw the sun. Once I started taking prescription cannabis the amount of drugs I took plummeted. When people call it a drug I get annoyed, because for me it has given me life," Kanuf said, his breathing labored.